Casual remote operation while babysitting.. Needless to mention ITU zone exchange is much easier to copy when dual CQing on two bands compared to serial numbers in a WPX contest. This was a real good one. Bands were closing quite late both days; last QSO on Sunday was K2VV (MO) at local midnight!!! Each multiplayer answered to CQs, almost no need to S&P. Work constraints limited the participation in the contest. It was fun to try Classic 24h with single radio, but the second radio was really missing sometimes when rates were slow and mults were needed. I have downloaded a freeware audio recording application which stopped recording time-to time. It became a part time activity due to a couple of reasons. Originally wanted to enter in SOAB to test the brand new setup and practice dueling CQ, but the low band antennas are far to be ready for an ARRL DX. Thus, decided to go for 20m only. Started Saturday on 40m and kept checking if 20m is open during the dark, but it was not..those days are gone.. this privilege is for the Scandinavian stations for the coming years. So, started late morning on 20m like everybody else and closed the day with 490 QSOs and 56 mults around 22:00UTC quite disappointed, anticipating the second day QSO count total would be below 1,000. Tought it is better to go back the original idea of testing the EA4TX interlock and practicing alternate CQing on 20/15. It was found to be fun, and gave a good learning experience after the Morse Runner simulator..
First serious SOAB(A)HP effort. Managed to get a three hours sleep only before the contest. entries and living the category made it clear there is a long way ahead to learn. gave a try to an EWE, it's been put up for the winter to see if it makes a difference. 40m was the greatest thrill during the entire contest. There are learnings around it though. but with low power only. This was the first time though I pumped them with the two amplifiers. required only for multidirectional beaming or multiplier hunting. this number of multipliers while kept having the feeling I lose valuable time from running. Maybe it's time to learn how to manage alternate CQing on two radios like those guys do. Without extensive expectations I have chosen 15m single band entry for this year. Knowing that the band will be open for much shorter than on 20m I set a goal of 1k QSO only and achieving a 15m WAS. I used (almost) the same setup as for the WW CW; inband SO2R and one of the KT36XA's. As the upgraded 2nd KT36 had been damaged during retraction after the WW event I decided to do the repair in the mornings before the band would open. The weather was lovely during the entire weekend from Friday till late Sunday promising perfect time for tower works in February. I assembled the mobile scaffolding; and once I was close enough to inspect the defects I recognized that the boom had cracked at the mast bracket. Plenty of the elements also needed repair and finally made the decision to dismantle it completely. Being prepared for this I have transported the 2 el 40m antenna with me to the hill for in case.. I made a good use of the time during the weekend and put up the new antenna. I also found some time to try the recently built K3 qrp trcvr and its remote head K3/0... this is awesome!!! Once it is further tested I put a report on the remote page. The contest itself was somewhat different compared to previous years experiences on 20m. Spending 35+ hours on 20m producing 1,2-1,3k qsos at very slow rates while the same can be done during 18 hours on 15m...just the band needs to be open to Europe. The rates were below 60qso/hour between 11 to 14 utc giving the chance to look around on the second radio; which was probably for the sake of illusion only that I kept the rates high.. since all multipliers answered to my CQ.. The next 4 hours were going between 100-130 qso/hour keeping me busy. The rates started to slow down again after 19utc, so I began to seek for non-worked stations on the second radio. The first day ended with 718 contacts in the log with 56 multipliers at around 22:30utc much later than the band closing been expected. 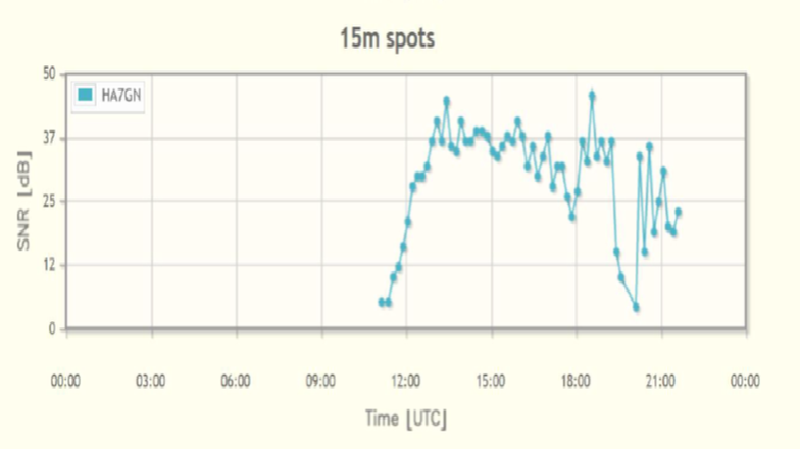 Actually, the signals were going down for approximately an hour between 19:15-20:15utc and opened up for another hour and a half. The figure below is taken from the RBN spot analysis tool; showing my signal strength at K3MM on the first day. The second day shown similar propagation conditions and closed even somewhat later than Saturday. The qso rates were slowing down relative to the first day as it normally happens. Sunday was producing less than 400 qso and 3 more multipliers. The final figures became: 1,105 contacts, 59 multipliers giving a total score of 195,5k points. As seen some of the claimed scores on 3830 and r5ga.com this result will not upset the guys at the top spots this year.. This coming weekend is planned to participate again on 15m in the SSB round and some 40m antenna trials besides hunting E3A!!! The preparations started in April when the 4L20m monobander has been dismantled in order to create space for the second KT36XA. I bought it used from HA0NAR Laci, purchased an upgrade kit from M2 and spent approximately the entire summer to clean/refurbish the old parts and make the upgrade. Being confident of experience gathered during the previous antenna assembly; I simply moved the semifinished parts to the distant QTH without performance trial.. This decision costed eight full days (and nights) on the hill in wind and rain in a period of three months. Planned to participate in the SSB part, but the antenna was not ready by that time. The old KT34XA has several dimensional differencies compared to the M2..36XA. Before transporting to the hill the individual elements were sub-assembled in the garage and carefully marked. During the onsite installation though, the resonance frequency were off by 4-500kHz on 15/20m, but was almost perfect on the entire 10m. I would not detail each different adjustment step made during the three months; including the complete disassembly and rebuilding the antenna to its original specified dimensions; I was even comparing its physical lengths to the earlier installed antenna which works flawlessly from day one. (they were identical within 1-2mm in length, but still..) As consistent modifications of the individual elements did not lead to an acceptable compromise among all three bands; finally all have been reset back to drawing callout. At the end rootcause been identified was the length of phasing lines between the two driven elements. Infact, the assembly is straight forward in case all components are newly supplied by M2. However, when vintage KT34XA components are to be used; some of them are different in length, diameter and needs to be resized (cut) as per the new specs. (Even if M2 says it does not have any effect.. it really does have.) Neither the old nor the new phasing lines tuned the antenna to the published curves, but their implication made me suspect that is where I need to investigate. Without changing the distance between the two driven elements I started experimenting with extended length flexible phasing lines (insulated stranded wire). After a few hours of wire-chopping I was able to find the optimal resonance for all three bands. Besides the "antenna bug" there were a few more Murphy's this year. But, at least I did not tear my biceps off this time. The night before the CW round the main amplifier has blown fuses twice and made me think I should use the spare for the contest after cca. four hours of repair and trials. A complete board needed to replace later. Earlier the year I have taken lessons online to learn ten-finger typing. On a Hungarian keyboard the position of the Z and Y are reverse to the English one, so I needed to replace my "old ham keyboard" to a new where the letters are at the "right" position.. The old one had PS2 plug the new has USB... and it does not like RFI... One hour before the contest a few turns of keyboard cable thru a snap-on ferrite did not seem strong enough to stop a repeated CQ... Once I started to transmit the keyboard lost its connection with the PC.. Fortunately, this happened only on 20m where I was mentally set for a year to participate. The gear was sharpen for single band assisted high power category with inband so2r; all pieces tested in advance, but the keyboard.. I gave the thing one last chance 30 minutes before the start; checked the setup for 15m, found no RFI there, downloaded quickly a propagation prediction and drafted the first 24 hour operating strategy. I should say I was lucky with this option since I gained a few extra hours before the band opening. Otherwise I could have started immediately a 48 hour session on 20m with zero sleep. These last couple of hours though, made me think a few times it had been better to pack and go home. At 00UTC I went to bed finally having in mind "I owe somebody with this" feeling and had a very good sleep.. while others started the contest. 15m had decent conditions during the entire weekend; except the Sunday closing that came earlier than expected. The recently installed satellite internet worked flawlessly throughout the contest providing enormous amount of RBN data for S&P enabling me to collect 154 countries and 39 zones. Multiplier hunting was much different with the inband SO2R than anytime before with the 2nd VFO. Shack ergonomics have also been improved since the last event, made me less exhausted by the end. The QSO count became 2,010 adding up to a total score of 872,030 claimed. It looks to be enough for a world 10. / Eu 5. CU soon in ARRL DX CW. The weekend of March 8-9th, 2014 became a casual participation in the SSB round of ARRL International DX Contest. Actually, the day before the contest I was not sure of the band I would choose. Still no full set of aerials were available for all-band categories. Propagation predictions anticipated excellent conditions for both 10 and 15m as well as the weather forecasts for the weekend in the Matra was promising. The program has finally been optimized for hiking and some WAS-hunting on 10m. The weather was like in late March, perfect for a good walk on the hill, and by the time I got in front of the radio I was almost fallen asleep.. I did not spend much time for preparations prior to the contest, only a fast installation of the radio, PC for logging and the PA, no electronic voice keying as no soundcard in the PC, only my own "voice-memory" after a decent flu. I needed to stop sometimes for discussions with goodwill neighbor hams that how terrible my audio sounds.. Finally, had some good runs, I mean relatively, as it was my first phone contest I have ever participated in my 27 years of ham radio. Managed 1.300 valid contacts and all 60 multipliers came back to my CQ. The 10m WAS target has been achieved. Heard plenty of QRP stations with no problem and received S9+20 reports several times. The setup was moderate this time; only one tribander fixed to NA, the old FT2000 and the PA set around 800W. The band was extremely crowded and was very difficult to find an empty spot for CQing. Once found one; the rx filters needed to be set very narrow to hear a thing besides the close big signals. I was far from the rates produced by the experienced stations in SSB contesting (HA8JV & HA3NU), but enjoyed operating a lot and understood how much important is practicing callsing reception thru contesting. The station super location has accountably brought its benefits again (regardless of the weak operator); I was still able to hear W5/6 stations clear and loud several hours after sunset. For me the CW part is the real thrill and will always be the priority to participate. It was fun trying something "new"; but the close two weeks difference between the two events will probably will make me focus on the first. I am planning to try in 2015 the SSB round in remote operation.